Oh how I love lemon. If you read last week’s Favorite Finds post or if you’re following along on Facebook, you probably already know this. But in case you don’t already know this, let me reiterate. I truly love lemon flavored cakes and drinks. I’ve always enjoyed sour and tart treats. When I was a kid, I loved to eat SweetTarts, War Heads and chew on Tear Jerkers gum. There’s just something satisfying about sour/tart flavors. Which brings me back to lemons. Have you ever had lemon cake or lemon cookies? Those are two of my favorite treats. I also enjoy munching on a slice of lemon pound cake from time to time as well. And lemon poppy-seed muffins? Yes, I could eat an entire batch of those. Which reminds me, I need to make some lemon poppy-seed muffins one day. The past few days I was craving lemon sweets so I pondered what I would make. I thought about making lemon cupcakes with lemon butter cream frosting or a lemon cheesecake. But I had just made cheesecake the other day and I didn’t really want to have cupcakes. So I got out my Better Homes and Gardens New Cookbook and searched for lemon recipes. I came across a recipe for Lemon Bars. The recipe seemed simple enough so it was the winner in my quest to bake a lemon sweet treat. These little bars are delish! I hope you enjoy this recipe. Oh yea, and let me know what you think of the recipe plugin that I am using. Do you like the format of the recipes like this or do you like my previous method better? Leave a comment and let me know! In a stand up mixer, using the flat attachment, beat the butter on speed 4 for 30 seconds. Add ¼ C sugar and beat until combined. Add 1 C flour and beat until the mixture is crumb-like. Press the flour mixture into an ungreased 8x8 baking dish and bake at 350 for 15-18 minutes or until the edges are slightly browned. While the crust is baking, in a mixing bowl, combine the eggs, ¾ C sugar, lemon zest, lemon juice, 2 tbsp flour and baking powder. Using a hand mixer, beat until the mixture is smooth and well combined. Pour the mixture over the finished crust. Bake at 350 for 20 minutes or until edges are lightly browned. Cool on a wire rack. Once cooled, sprinkle with powdered sugar, if desired. You have been lemon obsessed lately, lol! ;) Now I know I need to save all my lemon Sour Patch Kids & send them to you (I only eat the orange & red ones). Your lemon bars look great and I bet they taste as great as they look. I like the recipe plugin you are using. It seems to blend in well with your site design. We have made something very similar to this before and it is delicious! Enjoy! Oh these look delicious! It’s lunch one & I’m starving! This is a great recipe & I’m going to save it. I hope your having a great Wednesday! YUM, I love lemon, these look so delicious! I love the recipe plug in, looks wonderful! Yes, def love the plug-in…. and the lemon bars!! I’ll take one batch, please! 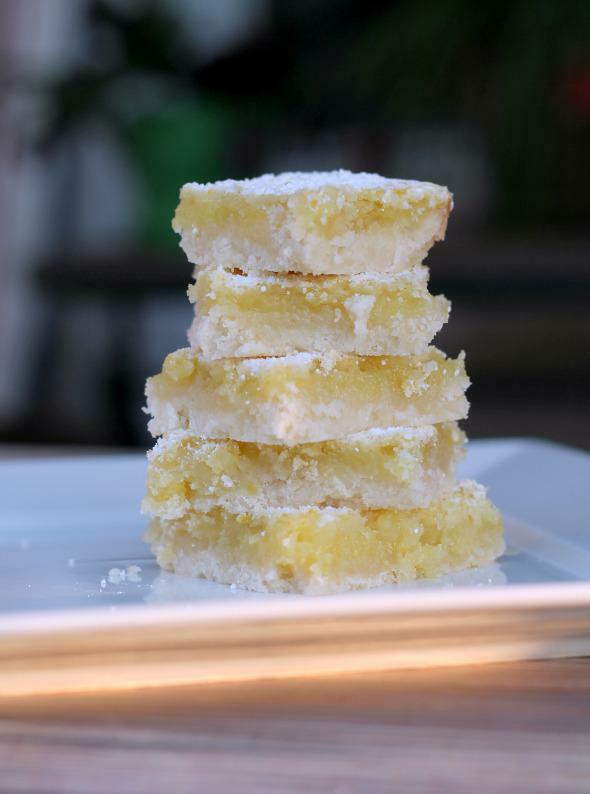 I LOVE lemon (lemon anything) bars, these look and sound amazing! I like the new plug-in lots :) What is it? These look so yummy! Thanks for sharing at Two Cup Tuesday at Pint Sized Baker . I hope to see you again there tomorrow night! I too love lemon. When I was pregnant with my 1st born I ate something lemony every day! I always craved lemon bars. I will have to try these! your lemon bars are beautiful. We have a link party called Wednesdays Adorned From Above Blog Hop and would love to have you share this and any other posts with everyone. It runs from Tuesday night through midnight Sunday. Here is the link to the party. You do not even understand my love for lemon bars. Give me lemon over chocolate any day! I just tried this recipe and the bars are great! I love the texture and the sour and sweet taste is delicious. This is a must try!